Hollywood's go-to geezer may just have given the performance of his career. Since 2001, Sir Ian McKellen has been playing Gandalf in a seemingly endless succession of Lord of the Rings and Hobbit installments. That's a long time to spend under a fake beard. After years of going through the motions in sequel after sequel, imagine his relief when given a chance to flex his theatrical muscles. The actor reunites with Gods and Monsters (1998) director Bill Condon for a project — recently released on DVD — that succeeds at something I would've thought impossible: coming up with a totally new take on Sherlock Holmes. 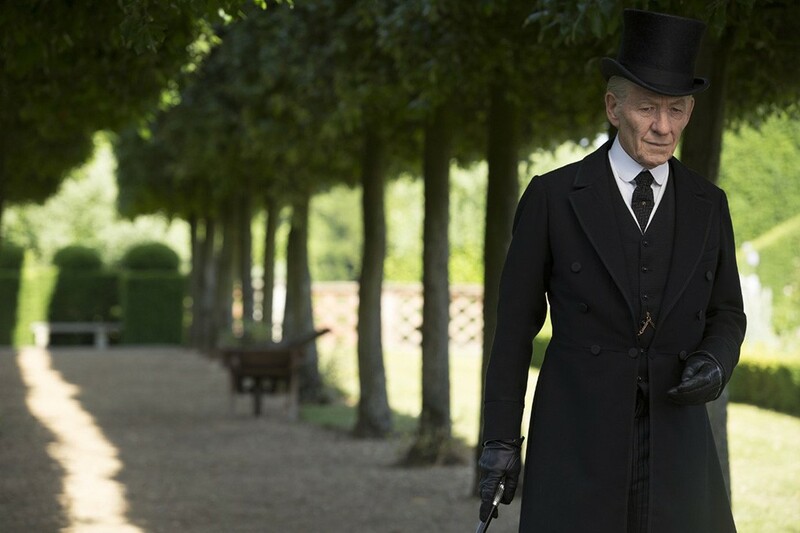 Just when you're sated on the sage of Baker Street (there's the BBC series starring Benedict Cumberbatch, the CBS show with Jonny Lee Miller and Lucy Liu, and those Guy Ritchie movies featuring Robert Downey Jr.), along comes Mr. Holmes. The film is so revelatory, remarkable and richly original, it's guaranteed to leave you craving more. Based on Mitch Cullin's 2005 novel A Slight Trick of the Mind and adapted by Jeffrey Hatcher, the movie is founded on two innovations that together give it extraordinary freshness and depth. First is the premise that the legendary detective was a real person, rather than the creation of Sir Arthur Conan Doyle. Here he's a celebrity sleuth whose escapades have been turned into best sellers by his partner in crime solving, Dr. John Watson. Second, he is 93, decades into retirement and out of the public eye. He's living in his seaside Sussex estate, where he devotes his time to beekeeping, botany and acting as surrogate father for Roger (a terrific Milo Parker), the precocious young son of his widowed housekeeper, Mrs. Munro (Laura Linney). A melancholic rumination on loss and lost chances, the picture offers a poignant portrait of a man who's lived a life of the mind — only to find his betraying him in old age. A firm believer that "One shouldn't leave life without a sense of completion," Holmes has set himself to the task of authoring an accurate account of his final case. It was an affair about which he has reason to believe the long-departed Watson failed to disclose the full truth. Director Condon deftly moves back and forth in time between 1947 and the London of 30 years earlier. McKellen makes palpable the famed detective's frustration as his memory repeatedly loses the trail. Bit by bit, however, the pieces of the puzzle come together, and the frail old man is shocked to recognize the forgotten face of a woman (Hattie Morahan) whose life nearly became part of his own. And would have if not for a decision he made with his trademark emotional detachment. What a thing to witness: Holmes solving the mystery of his loneliness at last and the solution leaving him profoundly haunted and hurt. His once-infallible mind may be faltering, but he's able to see all too clearly that he got life fundamentally wrong. In the actor's anguished eyes you can watch the thought form: He could have spent the years with her by his side instead of by himself. This is powerful stuff that at times veers surprisingly close to Amour territory. How could an achievement this magnificent and moving, so beautifully written, acted and directed, somehow pass under the radar in its theatrical run? I haven't a clue. Mr. Holmes is not showing in any theaters in the area.